Audi allroad Pros and Cons | Page 1 of 1 | Why Not This Car? What drives people to buy (or not buy) a certain car? 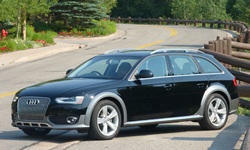 TrueDelta's members share Audi allroad pros and cons based on their real-world driving experiences. One of the best aspects of this car is the solid construction and feel. There is plenty of room all around, and the interior is well configured and constructed. Great on long drives. Looks and feels nice. The main reason we bought this crossover was because of its quattro awd system and its overall versatility. Large, wide-opening hatch, fold-down seats, low lift-in height translate to excellent cargo capacity. I expected better performance from a twin-turbo V-6. Carefully-designed, expensive-looking details, like the wheel arch moldings and the roof rails. The usual Audi interior, small details such as both overhead and direct lighting for the vanity mirror, the solid feel of the various controls, the red LED nighttime overhead lighting of the center console, et al. The Quattro full-time AWD is seamless, and the height adjustable suspension is amazing in snow country.